I have two items, one is $50/night and the other is $55/night. What I want to do is charge $50/night and $55/night respectively for a 1 night booking, $45/night and $50/night respectively for a 2-5 night booking, and $40/night and $45/night for a 6 or more day booking. I've setup a rule "2-5 days" with a minimum nights 2 and a maximum nights 5, and another rule "6+ days" with a minimum nights 6 and no maximum. Then under discounts, I have "2-5 Day Rate" which applies a $5 per item if it matches the "2-5 days" rule, and a "6+ Day Rate" with a $10/item rule if it matches the "6+ days" rule. If I book the $50/night item for 1 day, it's $50. For 2 nights, 2x45=$90, 3 nights, 3x45=$135, 4 nights, 4x45=$180, 5 nights, 5x45=$225. So far, so good. But when I book for 6 nights, it says the rate is $35 (applying both the $10 and the $5 discount??? Why would it do that when only the "6+ days rule applies? 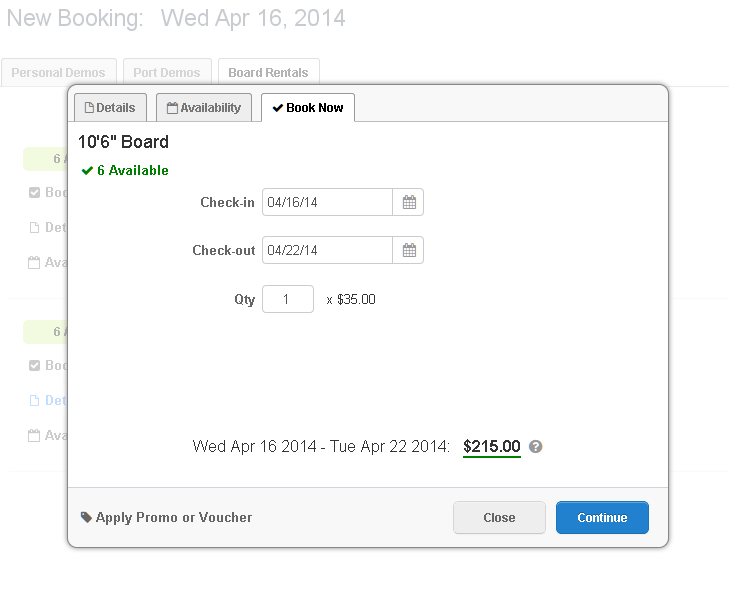 ), but the total is $215, which works out to $35.8333/night, or perhaps that's 6x35+5. Then 7 nights it's showing $35 as the rate, but the amount is $255, which appears to be the previous value plus $40 for the 7th night, even though it's still showing $35 as the nightly rate. Similarly, the 8 night total is $295, which again is the 7 night total plus $40. I can't see any logic behind how it's coming up with these numbers. I just want it to change the per night rate according to the number of nights they're booking, and apply that correctly. I'm extremely disappointed that the 3.0 rollout happened without this bug being fixed. I'm also extremely disappointed on another bug (related to discounts) this has not been fixed for more than 18 months now. I've been keeping reporting this problem to checkfront guys but although after version 3.0 release, this bug is still there. 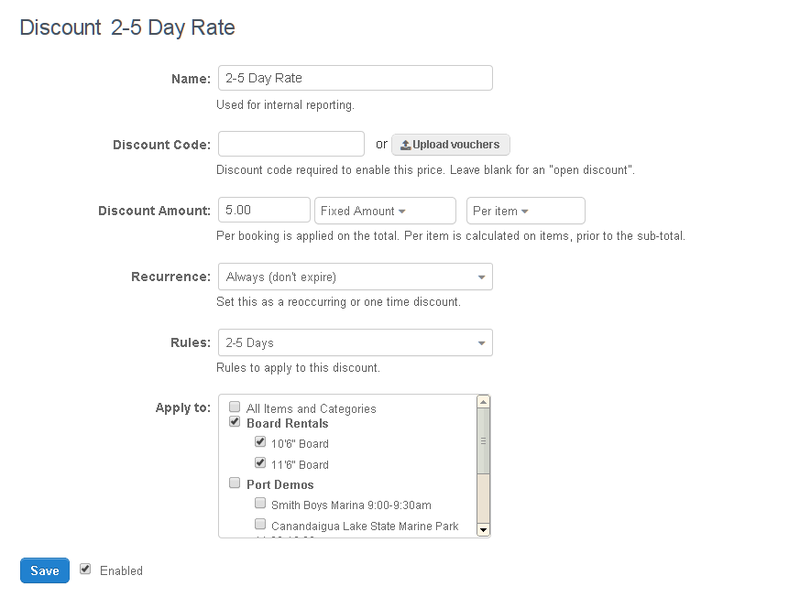 If you have an event to give some seasonal discount (such as 10% discount between 10 June 2014 - 9 September 2014) and if you provide another discount via discounts and rules (such as 5% discount for stays that are over 4 nights) and if you get a booking some part falling into seasonal discounted period and some part falling into the normal period( say a booking between 8-13 June for 5 nights) then although the total invoice amount is calculated correctly, the per night price that is written on the invoice is wrong! So when you multiply the number of nights (that you see on the invoice) with the per night price (that you see in the invoice), you can't find the correct invoice total. I've been reporting this bug for ages and following up but this is still not resolved. How respectable my guests see me when a simple invoice has wrong per night price on it? Then they start to question everything! I don't seem to have the same problems with discounts. We have around 60 discount codes, and maybe a half dozen seasonal discounts. Outside of that our setup isn't overly complex with only 8 items in our inventory, so maybe it's different than above. Since nobody ever believes me when I describe this problem, here are some screenshots to prove the issue. And just in case you think it's a one-off, I have the exact same issue on my developer account and on the site I'm setting up for a customer. 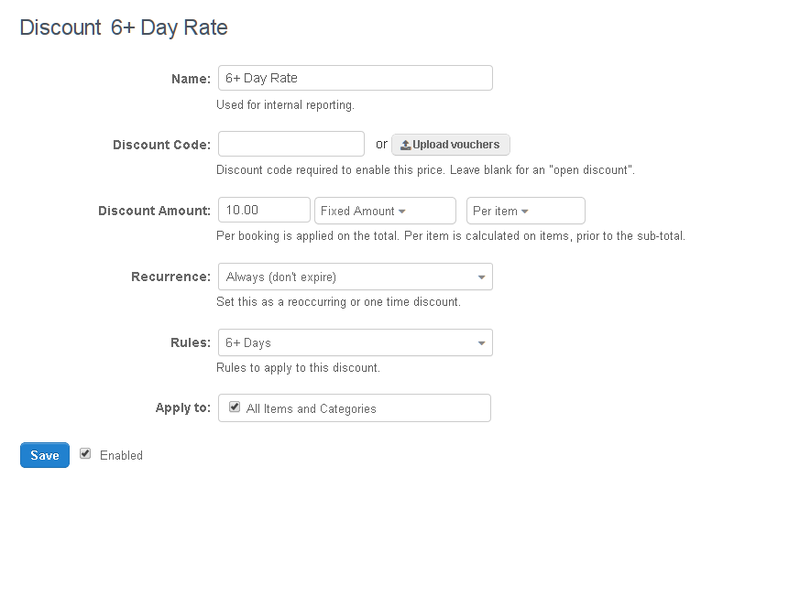 But if I attempt to make it a 6 day booking, instead of applying the $10/day discount, it shows the daily rate beside the quantity as "$35.00", and the total for 6 days as $215.00. Both numbers are complete nonsense. As a computer programmer, I can usually figure out what exact calculation somebody got wrong or what edge condition they missed, but this one baffles me. $215 is not divisible by either 6 days or $35.00. It's not even close to what should be showing here, which is $40/day and $240 total. By the way, I tried changing it from Discounts to Events, and the same thing happened. The exact same numbers. Oh, but changing the event price from "Dynamic price" to "Create new price" worked - I could set the 3 different prices for each individual item for 1 day, 2-5 days, and 6+ days and it now calculates the correct prices.